The activity could be used as a lab exercise supported by bigger picture discussions in the classroom. Optionally, the exercises may be done in small groups. Depending on time and facilities, collection and analysis of some sediment or soil samples for organic carbon content, stable carbon isotopes, and/or mineral surface area could be included. The problem sets could be assigned as homework. For upper level classes, students can find the journal articles themselves. Students may wish to refer to more recent journal articles to compare with more current analysis. No summative assessment is provided, so instructors may wish to look back over all three parts of the activity and tie the concepts and analysis together to make all parts of the activity coherent and relevant. 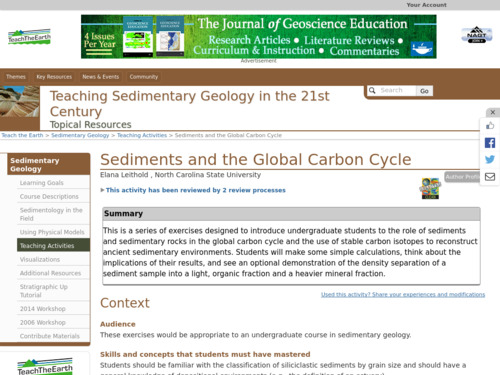 These exercises illustrate the role sedimentary rocks play in terms of long-term carbon storage and relevance to global warming. It also introduces students to the use of organic geochemistry-stable carbon isotopes for paleoenvironmental interpretations. Calculations are based on real data from journal articles (references are provided). Comment from expert scientist: The material is relevant and the data that students work with in this exercise is pretty current. I really like the fact that this exercise challenges student preconceptions about organic carbon, and lets undergrad students explore the "hidden" nature of vast amounts of OC in earth systems. Several routine calculations are required to complete the activity, so it gives students practice with quantitative skills. This activity involves students performing calculations using real data from linked journal article. The activity involves developing quantitative skills as well as critical thinking through interpretation of data. The instructor could assign this as group work, thus building collaborative skills. A demonstration of density separation of sediments and soils using Sodium Polytungstate solution can be included. Student handout, instructor's notes, and a solution set are included as well as bibliographic information that can be consulted for further information.